LiveU deploys more live IP video streaming units in New Zealand. Hackensack, NJ, May, 2016: LiveU has announced new wins in New Zealand, expanding the deployment of its portable transmission technology throughout the country. Used by all four national broadcasters, NZ’s largest Broadcast Services provider, leading radio stations and regional TV channels, LiveU leads the NZ cellular newsgathering market. Customers include: TVNZ, MediaWorks, Sky Network TV NZ, Maori TV, Kordia, Radio NZ, Christchurch TV and more. Service and support is provided by LiveU’s local partner, Pacific Live Media. TVNZ has recently doubled the number of LU200 units in the field with plans to adopt LiveU as its predominant method for live feeds in the coming months. Lindsay Chalmers, TVNZ’s GM Enterprise Operations, said “LiveU has been a game changer in giving us live capability directly from where the news story is developing. Its performance has been so impressive that it’s allowed us to rethink many of our pre-conceived ideas on delivering lives”. The majority of the units are being deployed in New Zealand, with its London, New York and Sydney bureau receiving LU200s. Weighing just over 500 grammes (1 lb) and available in a pouch or camera-mount configuration, the LiveU LU200 provides a highly cost-effective, reliable and easy-to-use solution for live transmission. LiveU is being used by the media for news and sports coverage, such as the recent protests over TPPA legislation, live casts from Fiji after Cyclone Winston and live coverage and remote production of local rugby games, at a fraction of the cost of traditional OB (outside broadcast) solutions. Customers are also using LiveU’s LU-Smart mobile app and Go-Plan, which gives broadcasters the opportunity to maximize their content gathering potential by providing LiveU software access to unlimited users within the organization. Broadcasters are able to purchase a pool of data every month for use among as many LU-Smart, LU-Lite and integrated Panasonic devices as they need. LiveU owns the patent for cellular bonding for remote news gathering in the US, Europe, China and other countries. 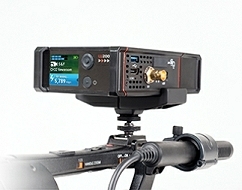 All LiveU products are based on this fourth-generation patented technology.